The latest in Hybrids, EV's and more.. The Paris Motor Show 2008 is currently underway with some wierd and wonderful vehicles being 'unwrapped' for the masses to see for the first time. 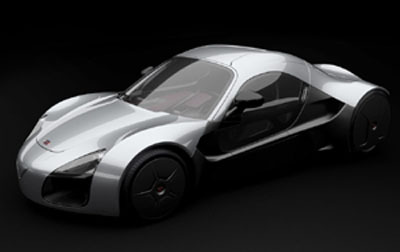 In Paris, Venturi have unveiled their latest EV beast, the Volage. The Volage created in partnership with Michelin also has a carbon fibre body like the Fetish but boasts the "most advanced technologies seen". Each wheel on the car holds two electric motors. Known as the 'Michelin Active Wheel, one motor to drive while the other handles active suspension. The car goes into limited production in 2012, to be assembled by hand in Monaco, like the Fetish, and if you have to ask the price, yup, you can't afford this little baby! Citroën previewed their Hypnos prior to the Paris Auto show but the debut in Paris shows the car to be even more extreme than first thought. Back to the Hypnos, we must impress on you that this is a concept car so the designers did have free reign, and boy did they take it! If you want to take "a powerful sensory experience, verging on the magical", then this may just be the car for you. 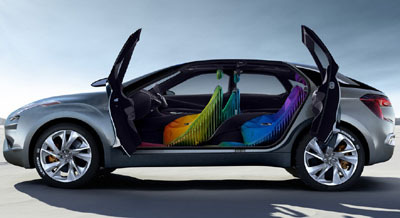 Apart from the rainbow interior, it features a camera which matches the mood of the driver by adjusting lighting and scented air-freshener fragrance. But wait, there's more; the original onboard clock changes colour as the light of the day changes, emitting "a succession of rhythmic colour pulses likethe breathing of a human being." Whoa, I'm feeling trippy and I am not even sitting in it! Small cars are still hugely popular, showing increased improvements in fuel efficiency through varied means. The new Mazda Kiyora concept hopes to achieve 30% fuel efficiency improvements, achieved through lightweight carbon fibre body, reduced drag coefficients, lightwieght transmission, and a small 1.3 litre engine. The car will also feature Mazda's 'Start Idle Stop System' which utilises the direct injection system to restart the car without using the starter motor. 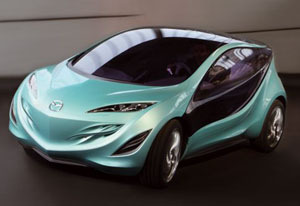 Its also a sleek and stylish little number, what else would we expect from Mazda, keeping the 'style' pundits happy. 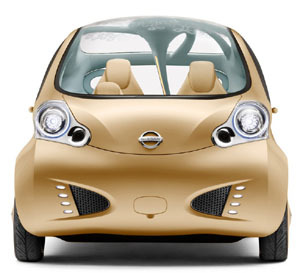 Lastly, heading into the wierd department is the Nissan Nuvu, seen as "a 'new view' into the future of the city car". This concept vehicle has got to be the most buggy looking car since the original beetle. The Nuvu is an EV with a rear placed motor and a Li-ion battery but interest lies more in the body design and green credentials. The Nuvu sports a "tree trunk" pillar internally which acts as a conduit for the enrgy produced by the leaf-shaped solar panels integrated into the glass-topped roof. All very futuristic looking, as is the interior instrument panel, more like driving a playstation. Natural, organic and recycled materials within the cabin add to the 'green-ness' of this zero-emission run-about of the future.